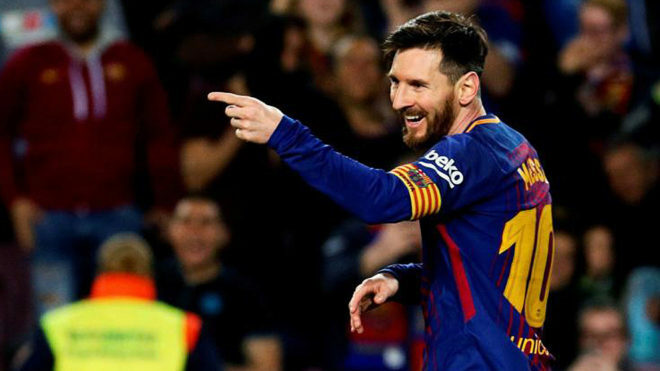 Lionel Messi scored a hat-trick as Barcelona fended off a pesky Leganes side, 3-1, on Saturday night at the Camp Nou in Barcelona. The Argentine struck for a pair of goals in the first-half, before Nabil El Zhar made things interesting with a goal midway through the second stanza to give Leganes hope. 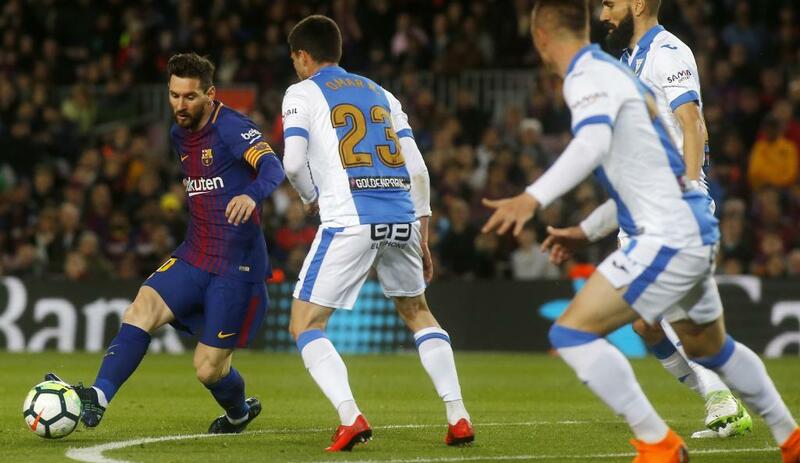 However, late on Messi would settle matters with a goal that sealed another three points for Barcelona, who remain unbeaten through 31 LaLiga matches this season. Manager Ernesto Valverde made a host of changes from the team that downed Roma in midweek, as defenders Samuel Umtiti and Jordi Alba and midfielders Sergio Busquets and Andres Iniesta were replaced by Thomas Vermaelen, Sergi Roberto, Andre Gomes and Philippe Coutinho, respectively. Leganes’ compact shape made for some tough sledding for the Barcelona attack at first. Manager Asier Garitano had all 10 field players behind the ball, clogging the middle in order to snuff out any quick passes. It looked like the home side would breach the visitors’ defence just shy of the 20-minute mark, but Leganes stopper Ivan Cuellar made a sprawling save to block a Luis Suarez shot. 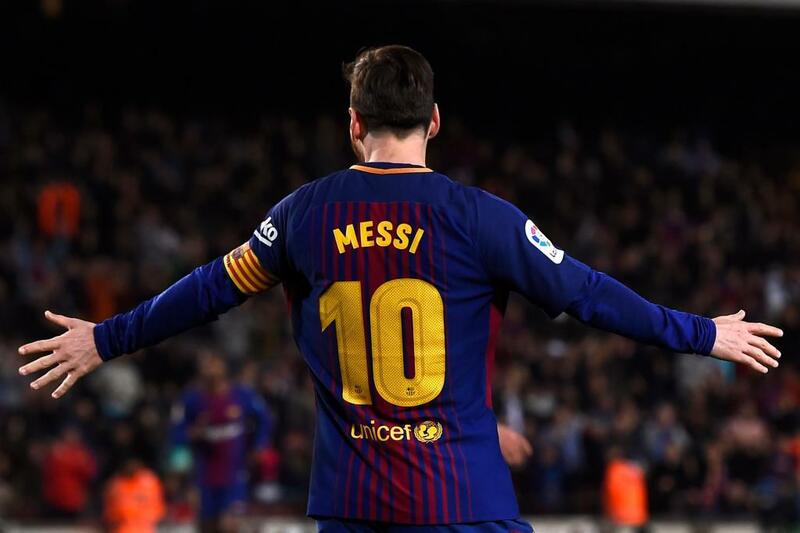 But there was nothing Cuellar could do to stop Messi from scoring the game’s first goal, as the Argentine hit a free-kick with his lethal left-foot that curled perfectly into goal to hand Barcelona the 1-0 lead. Messi was just getting warmed up. Minutes after his brilliant free-kick, he made another deposit into the Leganes net when he collected a surgically played pass from Coutinho, fended off a defender and rolled in a shot past Cuellar to extend the lead to 2-0. Leganes were still showing some fight and looking to get back into things. Garitano substituted on Beauvue for Amrabat at half-time and the former almost halved the deficit early in the second-half with a header that just missed. Barcelona were slumbering through the second-half, while Leganes’ belief began to grow. Midway through the half the hosts would pay for their sleepy play, as El Zhar received a pass and fired a shot that deflected in past Barcelona goalkeeper Marc-Andre ter Stegen to cut the lead to 2-1. Suddenly, it was nervy around the Camp Nou, so Valverde looked to restore order with the introductions of Alba and Iniesta, but it was still a one-goal affair heading into the final minutes. There was only man who could settle things though, and of course it was Messi. Ivan Rakitic played to Dembele, who lofted a chip into the area that Alba dummied, allowing Messi to take a touch and seal Barcelona’s 3-1 victory with his third goal of the night. 3.- Barcelona: Ter Stegen; Semedo, Pique, Vermaelen, Sergi Roberto (Alba, min. 74); Rakitic, Andre Gomes, Dembele (Denis, min. 90), Coutinho (Iniesta, min. 81); Messi, Suarez. 1.- Leganes: Cuellar; Zaldua, Bustinza, Siovas, Raul García; Eraso (Darko, min. 60), Ruben Perez (Guerrero, min. 77); El Zhar, Gabriel, Omar Ramos; Amrabat (Beauvue, min. 46). Referee: De Burgos Bengoetxea (Basque).